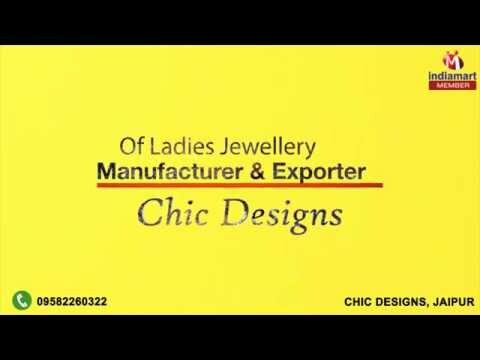 Welcome to Chic Designs, established in the year 2013, we are one of the leading manufacturers, exporters and suppliers of an extensive assortment of the finest quality of Ladies Jewelry. Inclusive of Diamond Hand Harness Bracelet, Pave Diamond Palm Bracelet and Silver Pave Black Diamond Bangle, we offer a wide range of high quality jewelry items. In accordance with the designs and specifications provided by the patrons, the offered jewelry items can be customized. Known for their impeccable finish, eye-grabbing appearance, contemporary design, neat finish and excellent shine, these jewelry items are crafted from quality assured metals, jewel, gems, stones and other allied materials. With the aid of our transparent business policies, we have been able to win the trust and admiration from our patrons. Experienced professionals such as designers and craftsmen have helped us in catering to the precise needs of our valuable patrons in the most efficient manner. We are exporting our products all globe.